At our Beach House, we are all about embracing the summer state of mind, when life is bright and carefree. Our philosophy? Rise early and worship the sun. Run outside. Soak in the sunshine. Take in the salty air. Watch the clouds go by. Jump in the sea. Drink in the sunset. Kiss under the stars. Watch the moon dance across the night sky. We love the endless summer lifestyle that Cayman offers and we feel blessed to be living in paradise. One of the ways that we have been sharing the summertime vibe with our guests is with a new activity that we unveiled at our Easter and Mother’s Day brunches – making gorgeous fresh flower crowns! It was such a hit that we wanted to share with you the basics of flower crown making (and don’t worry, it is easy to do at home). Get into the Beach House spirit and accessorize with a handmade flower crown! Fresh flowers of your choice! 1. Take a piece of floral wire and form it into a circular shape. Place it on top of your head and mold it to fit. It should form a loose crown around your head. Cut off the extra wire and form the rest into the crown. Tape the crown shut with floral tape, wrapping the tape around the wire several times. 2. Choose your greenery and fresh flowers. The greenery will be the base of your crown. Tape the greenery around the crown with floral tape, wrapping the tape around the wire several times if need be. 3. Once the greenery is taped down, add your fresh flowers. 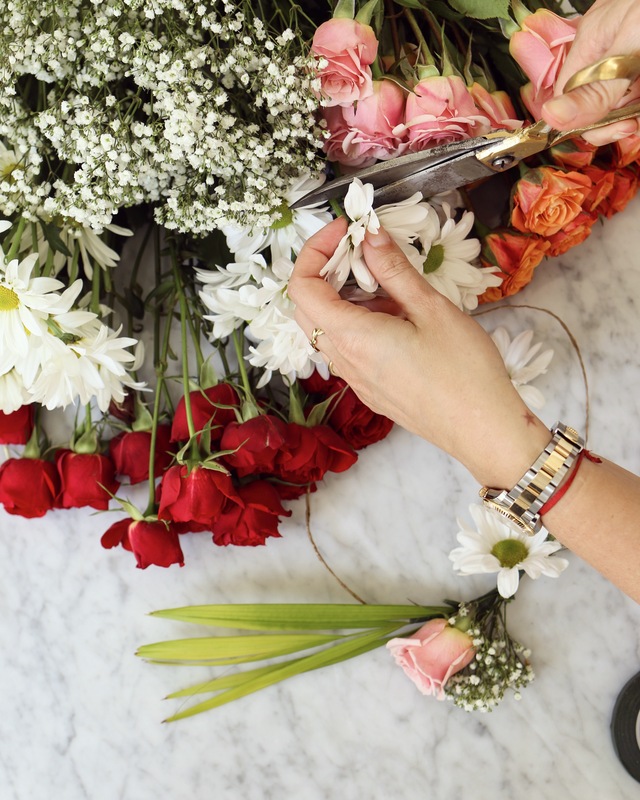 When attaching each flower to the crown, ensure the stem is at least 3 inches long. Just like the greenery, you can wrap the tape around the stem about four or five times to make sure it is secure. 4. Add as much flowers as you like! You can make a half crown, full crown, use different size flowers or various types of foliage to create a beautiful and textured look. Beach House tip: We love using different colors of roses in our crowns – they have such a gorgeous bohemian chic feel to them!